Does this ever happen to you? You see a wonderfully stylish lady on the street who, with a simple and inventive twist on a time-tested look, suddenly inspires you to reimagine your own clothes in wonderful new ways. This happened to me this morning, while reading my daily feed of The Sartorialist. If you don't know this blog, jump on it. Scott Schuman takes photos of wonderfully stylish, non-celebrity, multifarious people on the streets of New York, Paris, Rome, Milan. Critically, nobody has dressed them: no celebrity stylists nor Vogue-calibre visionaries nor "steal her style" editors from the cheapie weeklies. His subjects are originals, and great fun to see. Anyway, one of today's girls was so ravishing, sartorially speaking, that I rushed to my closet to get busy with her look. [Unfortunately I can't reproduce the photo here, his copyright warning is very stern indeed, so just click on this link to see it]. 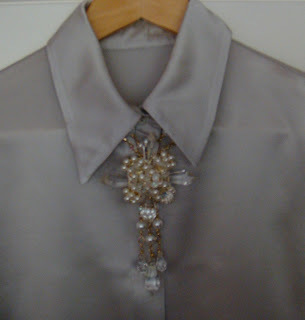 Here are my variations on the theme--a pointed collar blouse buttoned all the way to the top, with something interesting sitting biblike underneath. I don't have this girl's fantastic feather collar but I do have a nice lace scarf . . .
Alternately, a chunky crystalline Chanel-like necklace that seems too over the top for day wear. But settled down nicely against a geeky buttoned collar, well, ying meets yang, and I think I'll be wearing it this way in the daylight hours. Finally, while I've never been that keen on men's neckties on women, if you tone one closely to the color of the shirt/blouse, and if the fabric of said blouse is an ultrafeminine silk, and if you can't tie a tie to save your life and one end is much longer than it ought to be . . . then it could be, very possibly, a look. Any blouses in your wardrobe that could take a similar treatment? Remember that gorgeous lace collars are invariably underpriced and underloved at vintage sales . . . see if this doesn't give them a new way to be worn. I want the crystalline necklace. Great piece Christa. I got Scott's book which just came out. It's like a dictionary on how to get yourself together and out the door. Beautiful and interesting. Here is a link for you....was on the radio today, who knew this could all be so much fun!!!! !You should have been sitting next to me sharing the mike.If you go to the blog you can click on the link and hear my story, sordid but sweet...like life! I love the last look. I wear men's ties all the time. To job interviews even.. With Thomas Pink shirts and cuff links.